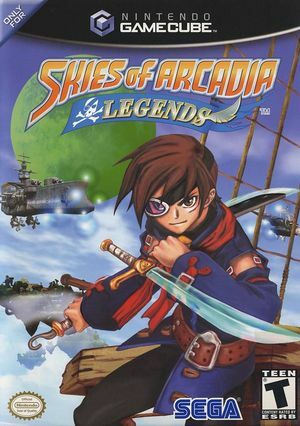 In Skies of Arcadia Legends grasp the wheel of your air-ship and prepare to embark on a legendary adventure. You are Vyse, a young member of the Blue Rogue pirates. Together with your childhood friend Aika and Fina, a mysterious girl, you are locked in an epic struggle with a powerful enemy nation for the fate of the world. You must gather your own crew of air pirates and journey through uncharted skies to vanquish the empire from every corner of the map. Along the way, you'll wage battles against savage monsters and evil pirates as you make a name for yourself on land and in the sky. Since 5.0-5745, textures in Skies of Arcadia Legends will appear blurry in the distance at internal resolutions above native, due to false positives in Arbitrary Mipmap Detection. Since 5.0-8296, this setting can be disabled to work around the issue. However, if any "mip trick" effects are used by the game, they will not work correctly. 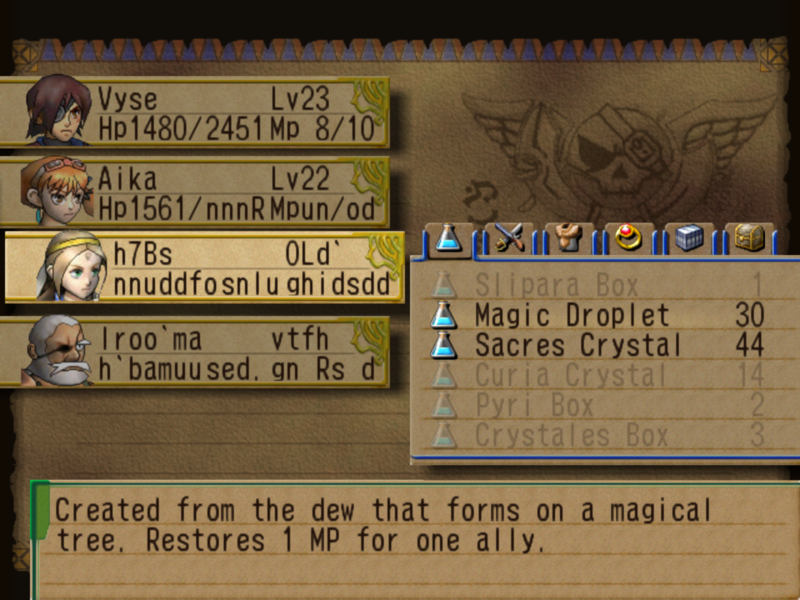 When scrolling through items in the item menu the text will flicker into random letters/numbers, making it really hard to make out the characters HP/MP. This starts to happens when enough items are on the list, only the first three pages are affected. Disabling dual core fixes this issue. A change made around 5.0-5400 seems to cause sections of the game to render off color (typically red) on Intel graphics hardware. Certain areas, such as Shrine Island appear to be more heavily impacted by this. 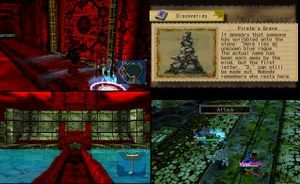 The following Gecko code Unstretches the HUD and fixes clipping issues with the Dolphin Widescreen Hack for the NTSC-U and PAL version of the game. Disable the Dolphin Widescreen Hack before using. This hack will break cutscenes with overlays and the widescreen camera will be squished. The graph below charts the compatibility with Skies of Arcadia Legends since Dolphin's 2.0 release, listing revisions only where a compatibility change occurred. 3.0-805 Windows 7 AMD Phenom II X4 965 @ 3.41GHz NVIDIA GeForce GTX 470 Not playable. Broken music on HLE, on LLE the music is 'jagged'. 3.5-392 Windows 7 Intel Core i5-3570K NVIDIA GeForce 560 Ti Needs LLE or the music and sound will be broken. To play on LLE you need a really fast processor, 3GHz + Ivy or Sandy bridge. There is a nasty graphical glitch that displays a green/blue box under the characters, kinda ruins the game for me. Other than that it's fine, no slowdowns. 3.5-1034 Windows 7 Intel Core i5-2500K NVIDIA GeForce 570 I recommend this release - HLE works and is good quality, unlike previous releases. No battle freezes. Performance is good - 200% with frameskip. Only issue is red/green shadows, but I stopped noticing them after an hour or so. Enable EFB Copy to RAM and Custom Projection Hack. Later releases seem to have severe graphical issues. 3.5-1266 Windows 7 Intel Core 2 Q6700 @ 3GHz AMD Radeon HD 4890 Audio works fine using HLE, however there are serious graphical issues with many textures not being displayed, which makes the game virtually unplayable. Slowdown was also an issue, but more powerful hardware should have fewer problems there. 4.0.2 Debian "Unstable" (Sid) Intel Core i7-4790K @ 4GHz NVIDIA GeForce GTX 750 Ti Runs mostly well. Minor graphics glitches with background textures in menus, but this occurs randomly and isn't consistent. Sound effects have very minor sync issues and play a split second off from onscreen action. Using LLE and 1.5x Internal Resolution with 340.96-4 NVIDIA drivers from Debian's non-free repos. This page was last edited on 28 January 2019, at 07:23.